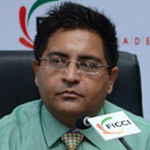 Mr. Rajeev Gulati, corporate professional, having all embracing experience of more than 18 years in Brand Protection arena, He is currently employed with Pernod Ricard in India, part of its global Brand Security team and is actively involved in devising brand security strategies for India. In the past has worked for Castrol India Ltd, part of the global legal team of BP Plc where he was responsible for IPR protection and managing litigations arising out of infringement of trade mark, copyright and passing off actions and also advising on IP related issues. A qualified law graduate having handled numerous enforcement actions against more than 700 counterfeiters / infringers of Intellectual Property Rights in India.